Join the festivities with ReVision Energy at the Children’s Museum on Friday evening, December 6th in Dover, NH. In partnership with the Children’s Museum, we will be holding a toy drive to benefit the Dover Fire Toy Bank, during the Museum’s Dollar Deal Night and the City of Dover’s annual Tree Lighting. Please bring a new unwrapped toy or purchase one in the Museum Shop to donate. For every donation, you will receive a 20% off coupon for the Children’s Museum store. The museum will be open from 5:30 – 8 pm at just $1 per person. At 6 pm, join us outside the museum in Henry Law Park for the Tree Lighting ceremony and enjoy caroling and a visit from Mr. & Mrs. Claus. 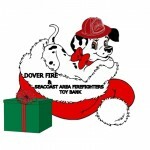 The Dover Fire Toy Bank has been coordinated by current and retired members of the Dover Fire & Rescue for more than 35 years. While Christmas typically conjures up visions of Santa and toys, they also provide educational aids, warm clothing, and boots to many children in need in the Seacoast area. Items specifically requested by the Toy Bank include: Toy Trucks, Stuffed Animals, Hats, Mittens, Scarves, Books, board games, basketballs, footballs, soccer balls, baseballs and gloves, electronic games, puzzles, dolls, radios (clocks or headsets), MP3 players, sleds and/or saucers, watches, and other gifts suitable for ages infant to 14 years of age. Gift cards for Fox Run Mall, Olympia Sports, Dicks Sporting Goods, music gift cards or to the Noggin Factory and any other local stores are also appreciated by all ages. Especially needed are gifts suitable for ages 10-14 years old girls and boys.